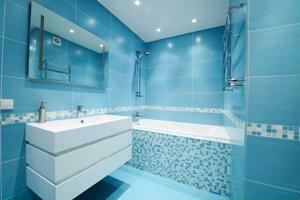 If you've recently purchased an old home, you may have a bathroom that looks like it belongs in another century. Between outdated furnishings and cramped quarters, your bathroom may need a lot of work to be updated. According to Better Homes and Gardens, reflective bathroom surfaces are an ingenious interior design trick to make a space feel much larger. This style can be incorporated rather easily with a new bathroom vanity. Use metallic or clear cabinet hardware to improve the glossy look of your counter space. A large framed mirror or standing an oversized mirror against a wall can be quick and easy ways to visually increase the size of the space. Behind your vanity area, you could opt for a reflective type of paint to improve the room's use of light, or opt for a mosaic tile design. You can create nearly any design imaginable with these tiles, so mix and match to find the combination that will work during any season. Use of light and iridescent surfaces can make a huge difference in a cramped washroom. What kinds of space-saving tips do you have for first-time bathroom designers?